Daewoo (Hangul:대우, Hanja:大宇, literally "Great Woo", after the first name of founder and chairman Kim Woo-jung) or the Daewoo Group was a major South Korean chaebol (type of conglomerate) and car manufacturer. It was founded on 22 March 1967 as Daewoo Industrial and was declared bankrupt on 1 November 1999, with debts of about US$50 billion ($75 billion today). Prior to the Asian financial crisis, Daewoo was the second largest conglomerate in Korea after the Hyundai Group. There were about 20 divisions under the Daewoo Group, some of which survive today as independent companies. 1.1 Daewoo Motor Co., Ltd. There were about 20 divisions in the Daewoo Group. Daewoo Electronic Components manufactures and sells a variety of electronic parts and components, especially for automobile, televisions, monitors, and other multimedia products. Daewoo Precision Industries produced small calibre firearms and auto parts. It was spun off in February 2002 and relisted on the Korean stock-market in March 2002. It was renamed S&T Daewoo Co., Ltd in September 2006, and then S&T Motiv Co., LTD in March 2012. A further subsidiary was the Daewoo Development Company, funded by cash from the Group and set up to develop hotels. Seven were built in Korea, China, Vietnam, and Africa. They were personally designed and furnished by Kim Woo-jung's socialite wife Heeja, who was chairwoman of the company. The most lavish is the 5-star Hanoi Daewoo Hotel, which cost US$163 million to build in 1996 and was decorated by Heeja with fine art, porcelain, sculptures, and marble. She invited 3,000 guests to the opening, including Russian President Vladimir Putin. Kim is believed to have spent time there while "on the run". Daewoo Motor Co., Ltd. was founded when the Daewoo Group purchased Saehan Motor in 1978, but the Daewoo Motor name did not appear until 1983. The Daewoo Motor brand appeared in the UK in 1995. At the time, it was the only manufacturer not using traditional dealerships – it owned and operated its own retail network. It was once considered to be among the top 10 motor companies in terms of production. Due to financial trouble, Daewoo's automotive arm, Daewoo Motor, was sold to General Motors (Korean) in 2001. The Daewoo nameplate continued in South Korea and Vietnam until 2011. The former Daewoo facilities are now producing General Motors vehicles for Asian markets. Daewoo Commercial Vehicles Division was sold to Tata Motors. 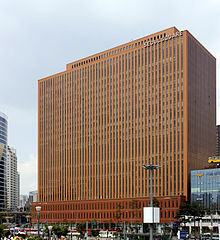 The Daewoo Group was founded by Kim Woo-jung in March 1967. He was the son of the Provincial Governor of Daegu. He graduated from the Kyonggi High School, then finished with an Economics Degree at Yonsei University in Seoul. During the 1960s, after the end of the Syngman Rhee government, the new government of Park Chung Hee intervened to promote growth and development in the country. It increased access to resources, promoted exports, financed industrialization, and provided protection from competition to the chaebol in exchange for a company's political support. In the beginning, the Korean government instigated a series of five-year plans under which the chaebol were required to achieve a number of basic objectives. Daewoo did not become a major player until the second five-year plan. Daewoo benefited from government-sponsored cheap loans based on potential export profits. The company initially concentrated on labor-intensive clothing and textile industries that provided high profit margins because of South Korea's large and relatively inexpensive workforce. The third and fourth of the five-year plans occurred from 1973 to 1981. During this period, the country's labor force was in high demand. Competition from other countries began eroding Korea's competitive edge. The government responded to this change by concentrating its efforts on mechanical and electrical engineering, shipbuilding, petrochemicals, construction, and military initiatives. At the end of this period, the government forced Daewoo into shipbuilding. Kim was reluctant to enter this industry, but Daewoo soon earned a reputation for producing competitively priced ships and oil rigs. During the next decade, the Korean government became more liberal in its economic policies. Small private companies were encouraged, protectionist import restrictions were loosened, and the government reduced positive discrimination (affirmative action), to encourage free market trade and to force the chaebol to be more aggressive abroad. Daewoo responded by establishing a number of joint ventures with U.S. and European companies. It expanded exports of machine tools, defense products (under the S&T Daewoo company), aerospace interests, and semiconductor design and manufacturing. Eventually, it began to build civilian helicopters and airplanes, priced considerably cheaper than those produced by its U.S. counterparts. It also expanded efforts in the automotive industry and was ranked as the seventh largest car exporter and the sixth largest car manufacturer in the world. Throughout this period, Daewoo experienced great success at turning around faltering companies in Korea. In the 1980s and early 1990s, the Daewoo Group also produced consumer electronics, computers, telecommunication products, construction equipment, buildings, and musical instruments. Daewoo Group ran into deep financial trouble in 1998 due to the 1997 Asian financial crisis, increasingly thin relationships with the Korean government under President Kim Dae Jung, and its own poor financial management. With the Korean government in deficit, access to cheap and nearly unlimited credit was severely restricted. In 1998, when the economic crisis forced most of the chaebol to cut back, Daewoo added 14 new firms to its existing 275 subsidiaries, in a year where the group lost a total of 550 billion won (US$458 million) on sales of 62 trillion won (US$51 billion). At the end of 1997, South Korea’s four biggest chaebol had a debt of nearly five times their equity. While Samsung and LG cut back in the midst of the economic crisis, Daewoo took on 40% more debt." By 1999, Daewoo, the second largest conglomerate in South Korea with interests in about 100 countries, went bankrupt, with debts of about US$50 billion ($75 billion today). Soon after the demise, Chairman Kim Woo-Jung fled to Vietnam, and former Daewoo factory workers put up "Wanted" posters with his picture. Kim returned to Korea in June 2005 and was promptly arrested. He was charged with masterminding accounting fraud of 41 trillion won (US$43.4 billion), illegally borrowing 9.8 trillion won (US$10.3 billion), and smuggling US$3.2 billion out of the country, according to South Korea's Yonhap News Agency. On 30 May 2006, Kim was sentenced to 10 years in prison after being convicted of fraud and embezzlement. On the last day of the trial, Kim tearfully addressed the court, "I cannot dodge my responsibility of wrongly buttoning up the final button of fate." According to an article in The Economist, dated 19 August 1999 (not long after Daewoo's bankruptcy), "Its failure was a long time coming." The downfall of Daewoo was and still remains highly controversial because of the sheer importance of chaebols in the national economy. The collapse caused billions of dollars in losses for both South Korean banks and the government, who were forced to stage-manage[ambiguous] Daewoo's dissolution to soften the blow. The bankruptcy was not only a financial crisis, but also a political one, and it came as a shock to much of the nation. Michael Schuman of Time stated that while Daewoo's demise had significant consequences, it would have nonetheless been better than propping it up with fresh funds. There was a persistence of the belief that Daewoo and other Korean conglomerates were "too big to fail". Such belief led many bankers and investors to continually waste money on bailouts, despite the sign that Daewoo was unable to engineer a turnaround and repay these bad loans. Once the too-big-to-fail perception was dispelled, with large conglomerates no longer considered the safest investments, bankers and investors began financing new opportunities in areas which had been starved of capital, such as small firms, entrepreneurs and consumers. Korea's GDP actually rose after Daewoo's unwinding. Schuman also noted a similar analogy with Japan during its lost decade of the 1990s, where banks kept injecting new funds into unprofitable "zombie firms", on the belief that the firms were too big to fail. However, most of these companies were too debt-ridden to do much more than survive on further bailouts, which led to an economist describing Japan as a "loser's paradise." Schuman states that Japan's economy did not begin to recover until this practice had ended. The group was reorganized into three separate parts: Daewoo Corporation, Daewoo Engineering & Construction and Daewoo International Corporation. They are active in many markets, most significantly in steel processing, ship building and financial services. The corporate entity known as "Daewoo Corporation" is now known as "Daewoo Electronics" and is focused solely on manufacturing electronics. Daewoo Electronics survives to this day, despite bankruptcy, with a new brand logo "DE", but many of the other subsidiaries and divisions have become independent or simply perished under the "reorganization" by the Korean government under Kim Dae Jung. In North America, Target stores market Daewoo Electronics products under their "Trutech" brand on an ODM basis. In 2004, General Motors pulled the Daewoo brand of vehicles out of Australia and New Zealand, citing irreparable brand damage. Later that same year, GM announced that Daewoo Motors in Europe would change its name to Chevrolet on 1 January 2005. In 2005, it was announced that Daewoo cars would have a Holden badge in Australia and New Zealand. In South Africa, Thailand, and the Middle East, Daewoo models were already branded Chevrolet. In South Korea, Daewoo was renamed GM Korea. As part of the company reorganization, the content and the structure of its brand portfolio (its brand architecture) was reorganized. In 2011, GM discontinued the Daewoo brand name in South Korea and replaced it with the Chevrolet brand. In 2015 , Daewoo brand was relaunched as Ravon / GM Uzbekistan . The Daewoo commercial vehicle manufacturer was taken over by Tata Motors. ^ "Bloomberg - Are you a robot?". www.bloomberg.com. Retrieved 2018-12-16. ^ "Company History". S&T Daewoo. Archived from the original on 2011-08-28. Retrieved 2011-08-09. ^ "Official S&T Motiv Co., Ltd. brochure, page 5" (PDF). Archived from the original (PDF) on 2012-06-03. Retrieved 2012-06-03. ^ Meredith, Richard (January 3, 2004). Which way next? (Revised ed.). [Newport Pagnell? ]: Mercury Books. ISBN 978-0954143237. ^ a b "Tata Motors completes acquisition of Daewoo Commercial Vehicle Company". www.tata.com (Press release). March 29, 2004. Retrieved 2016-07-06. ^ a b c "South Korea: The death of Daewoo". The Economist. 19 August 1999. Retrieved 2015-10-13. ^ "Daewoo founder Kim gets 10-yr term". CNN. 30 May 2006. Archived from the original on April 8, 2008. Retrieved 2008-11-20. ^ "Daewoo founder sentenced to 10 years in prison". www.atimes.com. Asia Times Online. June 1, 2006. Retrieved 2016-07-06. ^ Schuman, Michael (2008-12-19). "Why Detroit Is Not Too Big to Fail". Time Inc. Retrieved 2008-12-23. ^ "General Motors: A Reorganized Brand Architecture for a Reorganized Company". Merriamassociates.com. 2010-11-22. Archived from the original on 2012-06-04. Retrieved 2012-06-23. ^ "GM Korea Says Goodbye To Daewoo, Hello To Chevrolet". bernama.com. 2011-02-28. Retrieved 2012-06-23. ^ "Daewoo to tap Burma gas for China - Upstreamonline". Upstreamonline.com. Retrieved 2008-11-20. ^ "Blood Money - Chapter 7, Corporate Citizenship and the Oil and Gas Sector in Myanmar (Burma)" (PDF). nickyblack.com. ^ a b OT staff writers (2019). "Shwe Natural Gas Project". Offshore Technology. Verdict Media Limited. Retrieved 2019-02-13.